Today’s message is incredibly personal. I’m sharing because this is something that I imagine all of us have dealt with or will deal with at some point in our lives. At the very least, it’s probably a point of curiosity and discussion. I’m talking about communication of some sort with someone who has died. No, I’m not asking you to set aside your belief’s whatever they may be. I am simply asking you to consider having an open mind. To consider that perhaps, just perhaps someone who has left the planet earth is as close to us as our own heartbeats. Because I believe this is true. My youngest son died seven years ago. Such a hard thing for me to wrap my head around, even now. I remember so very clearly having conversations with people almost immediately, about feeling confident that Mike was still around, in a very different way of course. So, I guess it shouldn’t have surprised me when we began finding acorns at our lake home. It soon became very clear that these acorns were in fact, messages from Mike. I began keeping a journal of these occurrences and my thoughts and feelings when they were discovered. I needed to be sure that I wasn’t imagining things. Time went on and these experiences have continued. This was both an intensely personal experience and something that I wanted to share with the world. When the time was right. 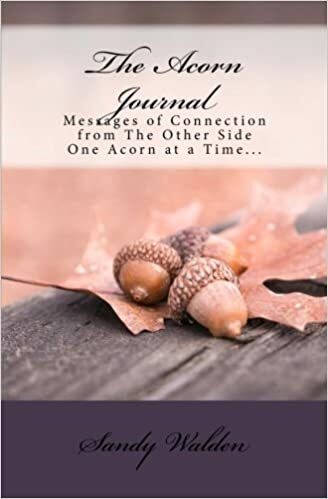 Well, it feels as though the time is right and so The Acorn Journal: Messages of Connection from The Other Side, One Acorn at a Time… has now been published and is available on Amazon. This is my story and yes, it continues. Because life does not end when we take our last breath, it simply transforms. I hope that reading my story reminds you that those you love are with you. Always. I hope that you share your own story of connection with me. I would love to hear it.